If you lose weight at Anytime Fitness, the Durango Food Bank benefits. Under a second-year program, the club will give a pound of food to the Food Bank for every pound its participating members lose during an eight-week period beginning today. Anytime Fitness owner Jeramie Neer, left, and manager Felicia Hubbell sack grocery items to be donated. 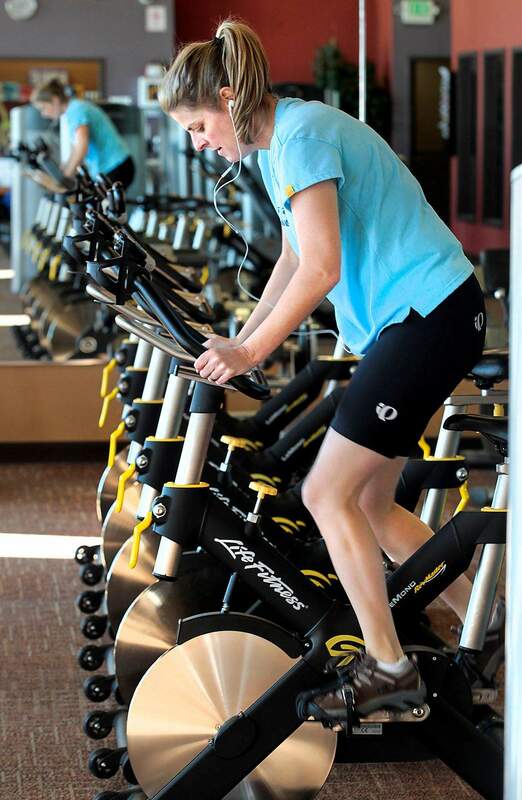 Jennifer Stollman spins at Anytime Fitness. She is participating in the Pound for Pound program to benefit the Durango Food Bank. Its that time of year. Gyms and health clubs again are enticing people with a new years resolution or a guilty conscience concerning their flabby physique with all sorts of offers. Reduced rates and prizes that include movie tickets and dining out complement workout regimens that hold an unspoken promise of weight loss, glamorous glutes and bulging biceps. Anytime Fitness takes it a step further by donating a pound of food to the Durango Food Bank for each pound lost by participants. Last year, it gave 180 pounds. Fitness Solutions 24/7, Anytime Fitness and the Durango Sports Club offer eight-week programs that measure and weigh participants pre- and post-workout and counsel them on diet in between. Jacob Nester at Crossfit Durango, which has free weights, kettlebells and gymnastics equipment, keeps it simple: a discount of $50 on a three-month membership if you sign up this month. At Fitness Solutions, Don Roberts is promoting his sixth annual Fitness Challenge, an eight-week get-in-shape program that has $300 in prizes for both a mens and a womens winner. The challenge measures gains in strength, muscle mass and flexibility and loss of fat and weight. The cost is $20. No need to be a member to join. I have members, ages 21 to 91, who weigh from 100 to 400 pounds, Roberts said. Anyone not up to the challenge but who wants to work out anyway can save $50 to $90 on a membership, get four months for the price of three, a free training session and a 30 percent discount on a customized eating plan. At the Durango Sports Club, the International Health & Racquet Sports Association underwrites the seventh annual I Lost It at the Club program, coordinator Chris Grotefend said. Participants are given a pedometer to log 7,000 to 10,000 steps a day (3.5 to five miles) for a minimum of five days a week. They decide how to train, choosing among free weights, treadmill, spinning, mat routine, Pilates, handball or Zumba. Sessions, three or four days a week, should last an hour to derive benefit. Exercisers also replace one or two meals a day with a high-protein supplement. People who stick it out for eight weeks can lose 15 to 20 pounds, Grotefend said. There will be prizes in several categories. Anytime Fitness is launching its I Lost It at the Club program today. Participants will do a variety of workouts and may attend a series of classes on nutrition and fitness. Individual progress is marked on a map of the Colorado Trail by a stickpin that is moved along as goals are met. There are no long warm-ups or cool-downs in either style, Hubbell said. Hubbell said the new year is a time for a fresh start, either for people who already have an exercise regimen or for people who want to take control of their health for the first time. Anytime Fitness also is offering prizes as an incentive.